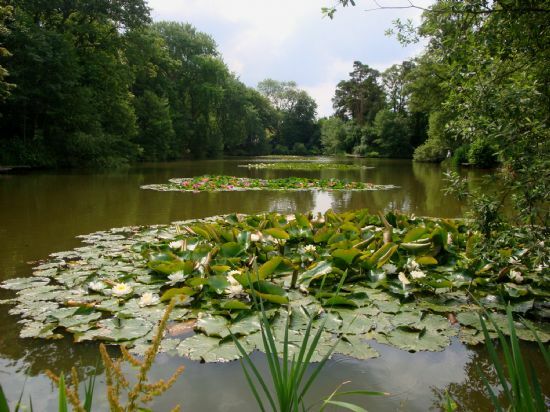 Set in beautiful surroundings on the outskirts of Watton, Loch Neaton comprises both a fishing lake, perfect for anglers of all ages and abilities, particularly resplendent when the lily beds are in flower and a picnic area. There is a pleasant walkway around the lake. A delightful lady called Avril Smith, who I met by chance whilst photographing the lilies at the end of June 2010, described the Loch as 'Norfolk's Unspoilt Monet's Garden', a very apt description for this beautiful and tranquil corner of Norfolk. In addition to the Loch, there's also a very pleasant grassed picnic area with picnic tables overlooking the Loch. Having entered the Loch area from the Sports Centre entrance, you will find a large grassed area to the right which was originally the bowling green until it moved to its current position within the Sports Centre grounds. The Loch area also provides an ideal location for walking the dog or just a bit of exercise. The path surrounding the Loch is ideal for a leisurely stroll, particularly pleasant with the sun dappling through the trees onto the path and sparkling on the water. If walking along the path, please do take care, especially in wet weather when the path may be slippery. Whilst we take every care to keep the Loch and the surrounding area well maintained, the weather and subsequent underfoot conditions are beyond our control! If you enjoy walking, a walk of approximately one mile, with no steps and just a gradual slope past the Loch, takes you from the town, through Nelson Court to the Sports Centre, before entering the Loch area via the pedestrian gate to the right of the car park, past the open grassed area on your right, down a gentle slope past the Loch, around the picnic area then back to the town by the same route. You could incorporate a walk around the Loch, relax in these tranquil surroundings or enjoy a picnic before making the return journey. We endeavour to keep the Loch area a pleasant place for all visitors, so could we please ask that you place your litter in the bins and also please clear up after your dog using the bins provided for this purpose. Loch Neaton is a registered Charity, managed entirely by unpaid volunteers and funded from fishing ticket revenue and donations from both individuals and local businesses. The town council have also provided grants for some equipment. We want you to enjoy your experience at Loch Neaton, but we do enforce NO FIRES, NO BARBEQUES policies. Loch Neaton is a pedestrian zone so cycling is not allowed and we ask users to respect this rule which is for the safety of pedestrians young and old. There are plenty of litter bins so please help us keep Loch Neaton tidy! Boating and swimming are no longer allowed, and skating on the Loch should it freeze over during a severe winter is also not allowed, all for safety reasons.